RAPIDLY becoming one of Australia's most mobile motorists is Lou Kingsley, 70-year-old Sydney racing driver. Lou's f 103 m.p.h. touring Holden sedan has been featured and tested in WHEELS and his successes on race tracks all over Australia with his 1 Jaguar, Mercedes and more recently, a Repco-Holden, are well known. Now he adds Australia's fastest commercial vehicle to his stable —a 130 b.h.p. 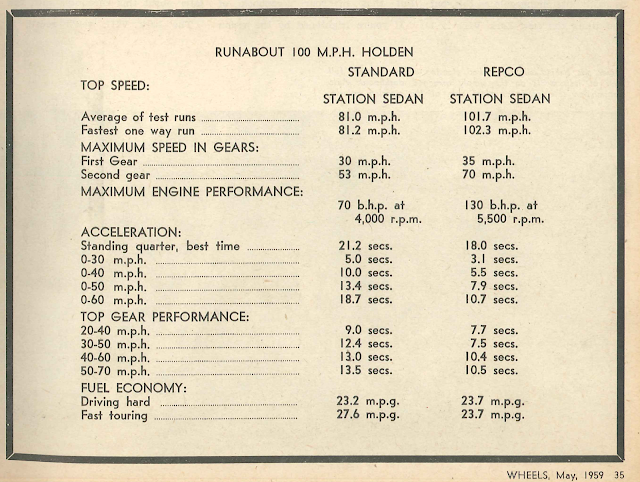 Holden station sedan, owned by Lou's wife, Flo, but modified to suit Lou's taste in rapid motoring. It is capable of a genuine 103 m.p.h. (see performance panel), provides startling acceleration, handles extremely well, yet is quite docile in top gear. This much we learned by hammering the vehicle over our test course, on a day that was punctuated by rain and freshened with gusty winds. Considering its terrific performance and the fact that we drove it with the loud pedal down for most of the time, the hot wagon exhibited a surprisingly modest thirst for pump petrol. As our comparison performance chart shows, it is only 14.5 per cent less economical than the standard version. Outwardly, the Kingsley Holden looks like any other. Inside there are a few changes which give a hint or two. The front seats are clearly ex-Jaguar and three additional instruments are neatly mounted in a subsidiary panel — a tachometer, water temperature gauge and oil pressure gauge. The Jaguar seats add a measure of comfort that has to be sat in to be believed. As fitted to this Holden the Mk. V Jag seats have been modified. Lou acquired them from a wrecker's yard, had them broadened, lowered and i e-trimmed with a base of foam rubber. In addition to providing the kind of support a passenger needs in a 100 m.p.h. car, these seats are fitted with four way adjustment — up, down, backwards and forwards. • An over-bored cylinder block, fitted with a Repco head. • Brakes with larger wheel cylinders and PBR booster unit. • A secret anti-thief ignition switch. We borrowed the vehicle when the speedometer was showing 4,025 miles. 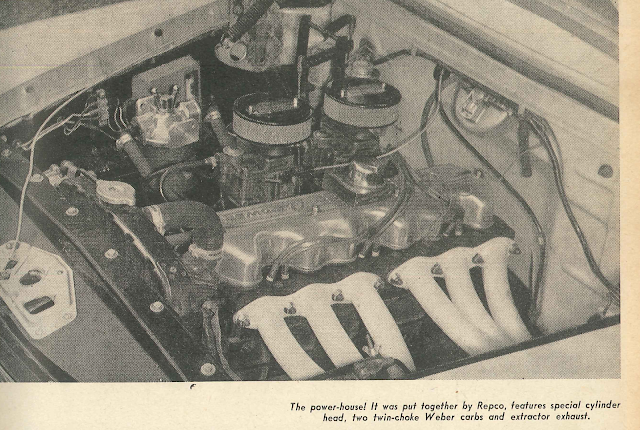 The Repco engine had been installed at 600 miles and was there-fore free enough to give of its best. Since the engine conversion alone had cost several hundreds of pounds, we asked the obvious question: "Will you be racing this vehicle, Lou?" "Definitely no. It belongs to my wife, so we'll use it only for shop-ping, for towing our caravan and normal touring." "Then why," we countered, "did you not put your money into one of the Detroit designs? Some have roughly the same power to weight ratio as this, even in stock form." Lou's reply was characteristic. "For years I have owned large American cars. Then I switched to the smaller car and, frankly, it will be a long time before I go back. I like a small vehicle. But I also like plenty of power. I would never be satisfied with a car with average performance, particularly as I tow a caravan on trips lasting thousands of miles. 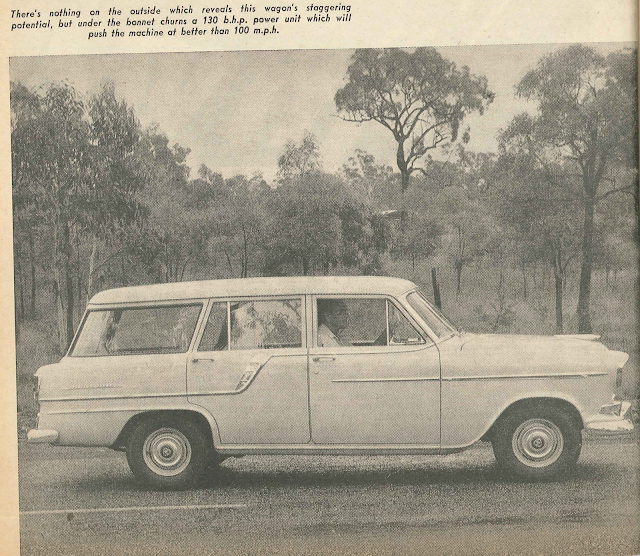 "I decided on a Holden station wagon after completing 30,000 miles in my Repco-Holden sedan. Its re-liability amazed me. Not only did the standard components stand up to the work, but the Repco head itself gave no trouble. So far, I have only replaced one set of valve springs and had the rocker arms rebushed." 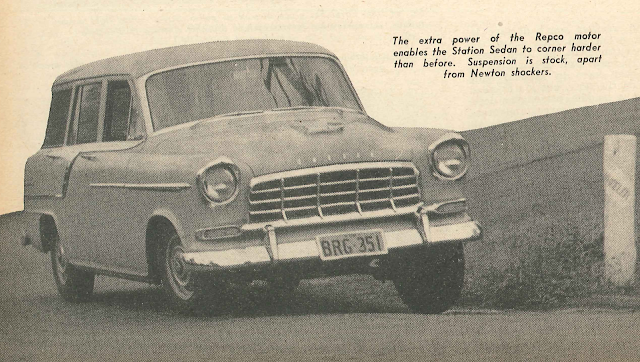 So, with that testimonial in mind, we took the Repco-wagon on a full-blooded high speed test, omitting our normal horror stretch of rough roads as the suspension characteris-tics have not been changed, except for the replacement of standard shocks with Newton units. Apart from the tremendous surge of power, we found that top gear flexibility was a surprise feature. Few really hot engines are amiable at low speeds, but the Repco conversion is an exception. The engine develops about 130 b.h.p. at 5,500 r.p.m. and is hot indeed. Yet on several occasions we found it possible to move away from 15 m.p.h. in top gear with a lively burst of acceleration and no detonation. Tramping on the throttle at 35 m.p.h. in top gear produces a sensation akin to being kicked in the tail by a football player. As the performance figures show, the acceleration in each gear is enough to leave most sports cars lingering in the background In comparison with the factory station sedan the Kingsley version is 25 per cent faster, 15 per cent quicker on the standing quarter mile and only 14.5 per cent less economical. Credit for this goes to the engineers at Repco. They built up this engine, with a compression ratio of 8.2 and cylinder bores enlarged to 38 in. We've given descriptions of the Repco conversion in these pages several times in the past and it would serve no purpose to go over the ground again. It is worth men-tioning, though, that the camshaft (in this particular car) is semi-race in grind, so as to give reasonable flexibility as well as abundant power. The block is a normal Holden unit and all parts were assembled with a selective fit by Repco. The crank-shaft and bearings are standard. The exhaust system consists of a double extractor, with three cylinders coupled to one extractor and the other three to a twin extractor, as shown in our photograph. At present the gases meet in a com-mon muffler but plans are afoot to introduce a second muffler. As it stands the system is some-what noisy, both when idling and working hard. Idling is rough. Rough, that is, in comparison with standard but certainly no rougher than could be expected from a power plant developing twice the power intended by the manufacturers. Rather surprisingly the engine runs very cool. Despite hard driv-ing, endless tests on the strip and several blasts over the measured quarter mile, the water temperature gauge never showed more than 140 degress F. throughout. At normal high speed cruising the temperature dropped to 130 deg., which is far too cool. For maximum efficiency an engine of this sort should oper-ate around 180 degrees water temperature, at least. This problem is one which will be worked on by Lou Kingsley later. When we tested the Holden the fuel economy worked out at 23.7 m.p.g. for fast touring and 20.2 m.p.g. during the period when we made all performance tests. Good though these figures were under the circumstances, Lou reports even better mileages on tour , he recorded 17 m.p.g. on occasions. found the braking to be adequate, provided that the remained cool. With a weighty caravan in tow and speeds around 60 m.p.h. where possible several We entirely drums expected, there is appreciable fade when the going gets really tough. Lou proposes to counter this by fitting PBR heavy duty drums in place of standard. At one stage he was considering fitting disc brakes to his sedan and later — if successful — possibly also to the wagon. He acquired a pair of cal-lipers and had the discs specially machined. The fourth disc proved blow-hole ridden and so the initial tests were suspended, pending further investigation. However, on expert advice, Lou finally abandoned the project. He had been assured that the disc brakes would require two booster units to give a reasonably light pedal pressure. Few cars nowadays are fitted with a cantilever throttle but Lou swears by them and his cars have been so fitted The throttle is hinged about two inches from the bottom and a small metal arch is attached to the base. The driver's heel sits in this, so that the throttle can be snapped shut merely by applying heel pres-sure. A really hot station wagon is a departure from the usual scheme of things, but it makes sense when you consider the specialised needs of a man like Lou Kings-ley. He wants sufficient power to pull a caravan at speeds higher than average and he also wants the vehicle to double as a high performance touring car. A fast station wagon fills the bill exactly.